People with less than ideal credit and other issues that make their FHA loan application more complicated may want to consider an FHA mortgage program. Loans guaranteed by the Federal Housing Administration usually feature flexible underwriting standards and low-down payments. Low interest rates are often available as well so get the facts before you apply for a FHA loan. FHA mortgage loans are very forgiving in terms of the amount of debt that you have on your credit report. This flexibility is very helpful for people who have less than perfect credit situations. Still, it is recommended that you reduce the amount of debt that you have on your credit lines. By reducing your debt level, you can increase your credit score by a large amount. How much? If you are able to eliminate $5,000 of credit card debt, you could easily boost your score by 30 points or even more. FHA rates are historically low, so in most cases you will get a competitive interest rate. The debt to income limits will vary by an approved FHA mortgage lender; lenders are allowed a lot of flexibility in deciding on the level of debt to income in their loan applicants. But the maximum according to FHA standards as of 2018 is 50%. So, all of your minimum debt payments, including mortgage, credit cards, student loans and car loans, cannot exceed 50% of your gross monthly income. FHA rules are very lenient in terms of loan qualification, but the days of 'no doc' loans are pretty much history. The government still requires all FHA loan applicants to document their level of income, credit, assets and liabilities. This means that you have to have proof of your income on paper. This includes pay stubs, W-2s, 1099s, two years of tax returns and bank statements. If you are self-employed, you will need to show a profit and loss statement for the year, two years of tax returns, and bank statements. Both regular employees and the self-employed also need to provide proof of their social security number. To be pre-approved for a FHA loan application, which is what you need to go shopping for a home, you will need to have the above documentation in order and on hand. Collect all of it before you start to shop for a mortgage and you can save yourself a lot of time. FHA lets borrowers have, theoretically, a credit score as low as 500 to qualify for a mortgage. That said, you will have a much easier time qualifying for a loan if you have a higher credit score than that. More FHA-approved lenders will be available with a credit score of at least 620. Those above 680 will have the most loan programs available to them. So, it is smart to improve your credit score as much as you can in the year before you plan to apply. Do not miss any debt payments. Pay down your debt. If you have any mistakes on your credit report that affect your score, dispute them and try to have them removed. The loan approval process will go smoother with a higher credit score, but you should not hesitate to apply even if your credit score is lower than you like. There are many people with relatively low poor scores who pay rent much longer than they need to. There is no cost or obligation to see what the FHA credit score standards are today so that you can determine what you need before spending time processing a home loan. A major advantage of the FHA loan program is very low-down payments. Right after the last recession, many loan programs required 20% down to buy a home. This puts home ownership out of reach for millions of people. Fortunately, things have changed a lot in the last five years. Now, FHA mortgage programs are again available for those who have only a 3.5% down payment, in some cases. You are required to have a 580+ credit score to qualify for such a low-down payment, and other qualifications may apply. You will however increase your odds of approval if you put more money down, and this will also lower your monthly payment. So, if you can, try to put down 5-10% or more. If you save money for at least a year before applying for an FHA loan, this is probably doable for most people. Note: With an FHA mortgage loan in 2017, you will have to pay for mortgage insurance no matter how much you put down, or how much equity you have. This is one disadvantage of the program. But if you put more money down when you close on the FHA loan, you could eventually refinance the loan into a conventional program. Once you have 20% equity, you can then get rid of private mortgage insurance with a conventional loan. FHA loan limits were raised again this year in many regions so that means more consumers can benefit from an increased purchase power with larger loan amounts on FHA insured mortgages. 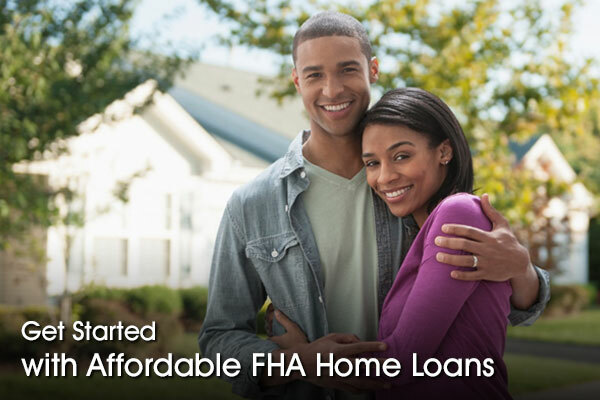 Getting an FHA mortgage is a great financial move for people with lower incomes and credit scores. You can qualify with a relatively high DTI ratio, a low credit score, and put down a low-down payment. Your chances for loan approval, however, will increase if you work on the above items prior to taking the steps to apply for a FHA loan. If you do that, you should be able to qualify for an FHA mortgage at a very competitive interest rate, even if you have a fairly low FICO score.